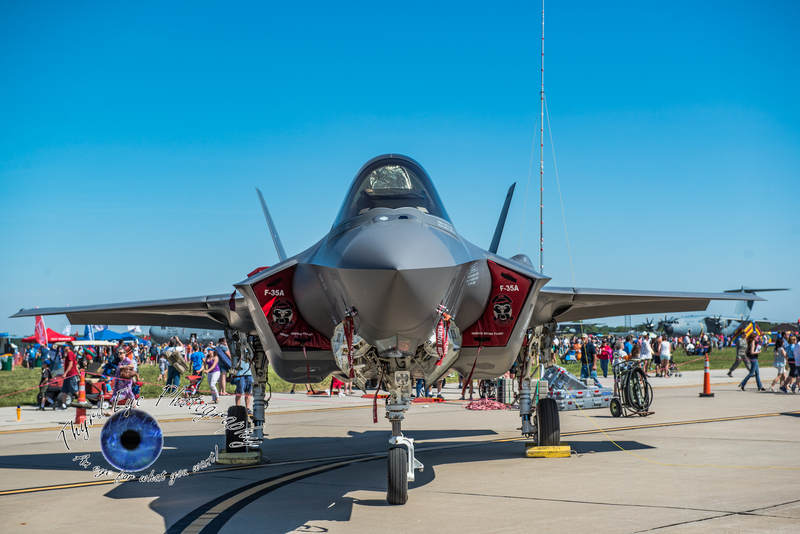 Last weekend Scott Air Force Base outside Belleville, Illinois celebrated its 100th anniversary with an air show and open house. The resulting celebration was a rousing success. Scott used to host an annual air show and open house, but that was scuttled after the 2012 edition due to sequestration cancelled most air shows around the country. But, after a five-year hiatus it was next to impossible to not honor one of the oldest air bases in the country. As was the case before the Scott Air Show and Open House was immensely popular. 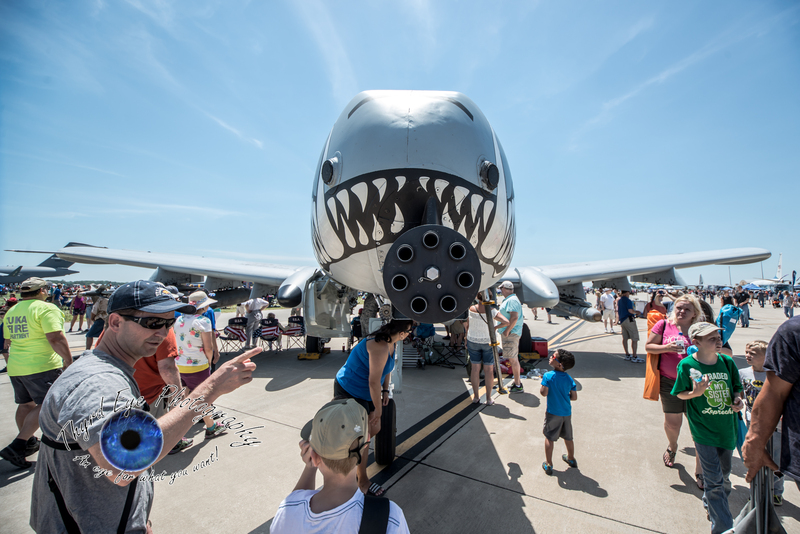 Thousands of aircraft enthusiasts, historians, friends and fans of air shows, people who like loud roaring engines, and curious folks who had never seen an air show all brought their families and friends to partake in the celebration. With a free admission and free parking there wasn’t much of an excuse not to attend this year. (The parking was very efficiently done, I might add. Kudos to the men and women in uniform directing traffic and putting up with civilians who could be cranky at times.) The only pause could have been the heat, but with the open field a very pleasant breeze rolled through and kept most of the crowd feeling pleasant. Walking through the main entrance the crowds were immediately greeted by static displays of military aircraft, most of which could be approached and given a very close up viewing. Some aircraft people could actually go inside and take a look, or in a few cases, sit in the cockpit. The mighty Boeing/North America B-1B bomber greeted visitors with its 137-foot wingspan (extended) and 146-foot length visitors were lined up for a chance to get inside. Past the B-1B and all up and down the taxiway there were dozens of aircraft like the KC-10, E-3 AWACS, C-130, C-21, C-40, the giant C-5 Galaxy, the C-17 Globemaster. Fighter jets included the F-15 Strike Eagle, the F-16 Fighting Falcon, the F-22 Raptor, and the new F-35A Lightning II. There were even World War II aircraft there like the B-25 Mitchell bomber, the same light bomber flown by the Doolittle Raiders in April 1942. There was even a KC-46 Pegasus flight refueling simulator where visitors could get a hands-on feel of how in-flight refueling is done. Overhead was a constant display of aircraft and Army Black Dagger parachutists. 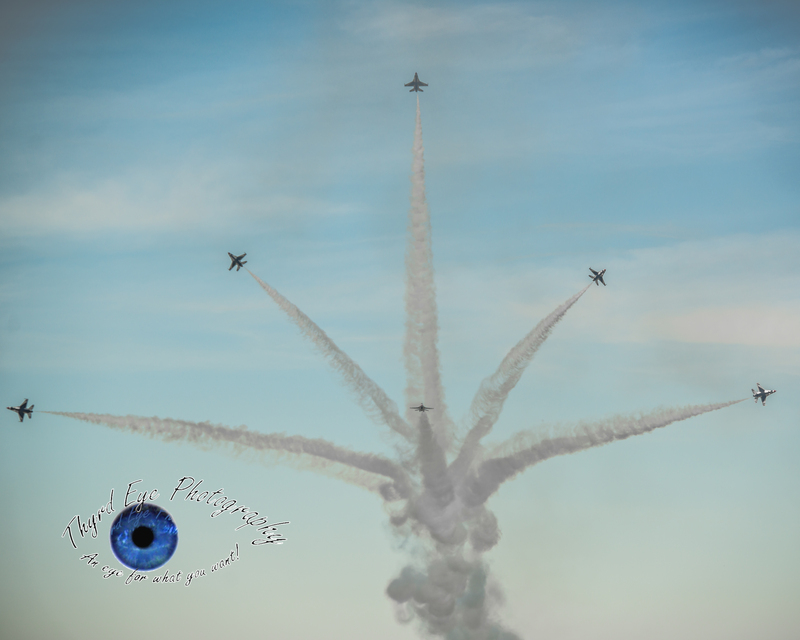 From a flyover of the B-2 stealth bomber to stunt aerobatics by Kevin Coleman there was always something going on. 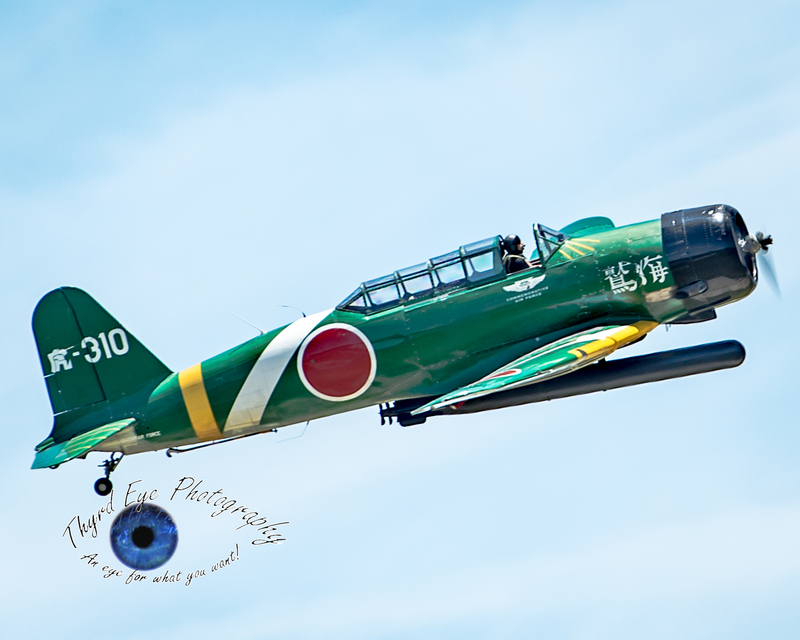 Some of the highlights of the airshow were Tora! Tora! Tora!, a reenactment group using eight replica Japanese aircraft to “re-create” the Japanese attack on Pearl Harbor. They utilized the aircraft to come in from different directions, coupled with timed explosions on the ground, to showcase the confusion and difficulties the men and women faced during the attack in 1941. It is a memorial to both sides that began in 1972 and is impressive each time I see it. The F/A 18 Hornet was a crowd pleaser as well, and a personal favorite. With its twin F404-GE-402 enhanced turbofan engines churning out a combined thrust of over 35,000 pounds the roar was certainly attention-grabbing. 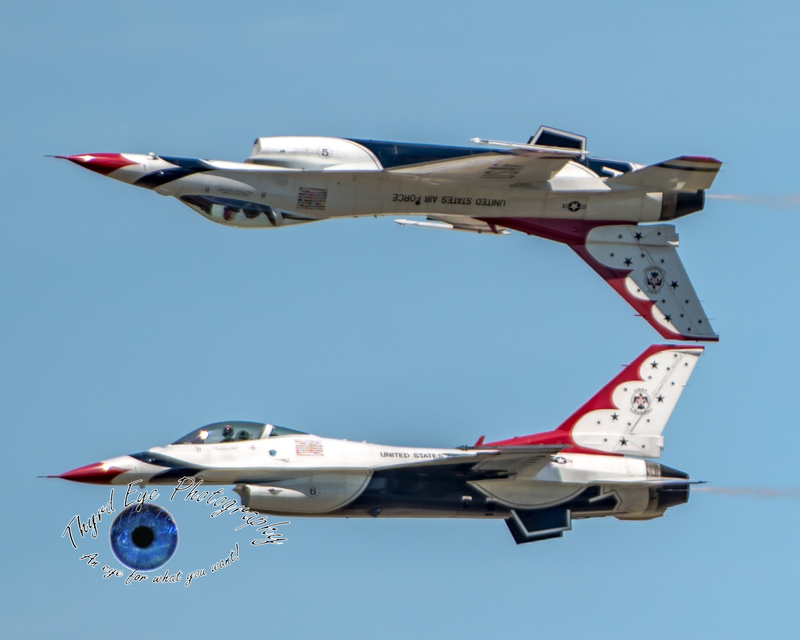 The USAF Thunderbirds were the main attraction this year and, as usual, they put on a stellar show, wowing the crowd with wingtip to wingtip maneuvers and high-speed passes. Some of the passes crisscrossed with just a few feet to spare. The precision flight maneuvers these pilots performed were a testament to their intense and thorough training. With plenty of food vendors, souvenir tents and accessible static displays there was plenty to see and do for just about everyone. The only drawback seemed to be a lack of informational signs in front of the planes for visitors who don’t know each aircraft, like they have had in the past. I, along with thousands of fans, miss going to the annual Air Show and Open House events, and it is sincerely hoped that we don’t have to wait another 5 (or more) years for the next available air show slot as Scott Air Force Base is the perfect venue to hold such events (ideally on a yearly basis). These pics are absolutely awesome! As always good work!